Event Facilitator Rich Acritelli, Rocky Point military alumni, elected officials, school administrators and local veterans. 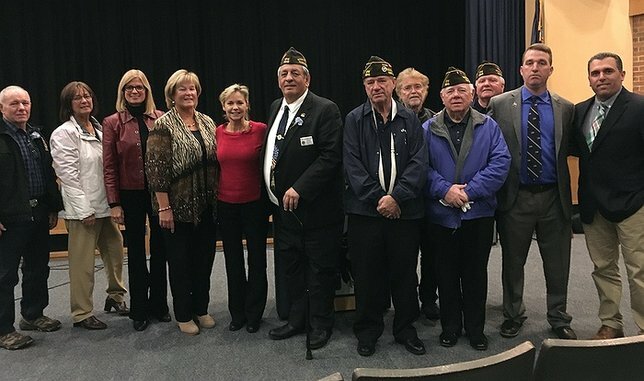 Rocky Point, NY - November 21, 2018 - On Friday, November 16, Legislator Anker joined the Rocky Point community at the unveiling of the Alumni Wall of Honor at Rocky Point High School to celebrate those who graduated from the Rocky Point School District and went on to serve in the United States Armed Forces. The Wall of Honor is located to the right of the main entrance to the high school past the main auditorium entrance. Subject: LongIsland.com - Your Name sent you Article details of "Legislator Anker Joins Rocky Point Community in Celebrating Alumni Wall of Honor"